View of Glencairn, 81 High Street, Dumbarton. Titled: 'Glencairn Greit House, Built 1623, Dumbarton, formerly the Town Residence of the Earl of Glencairn and the Duke of Argyll'. Scanned image of photograph showing Dumbarton, High Street, Glencairn Greit tenement. View from West. 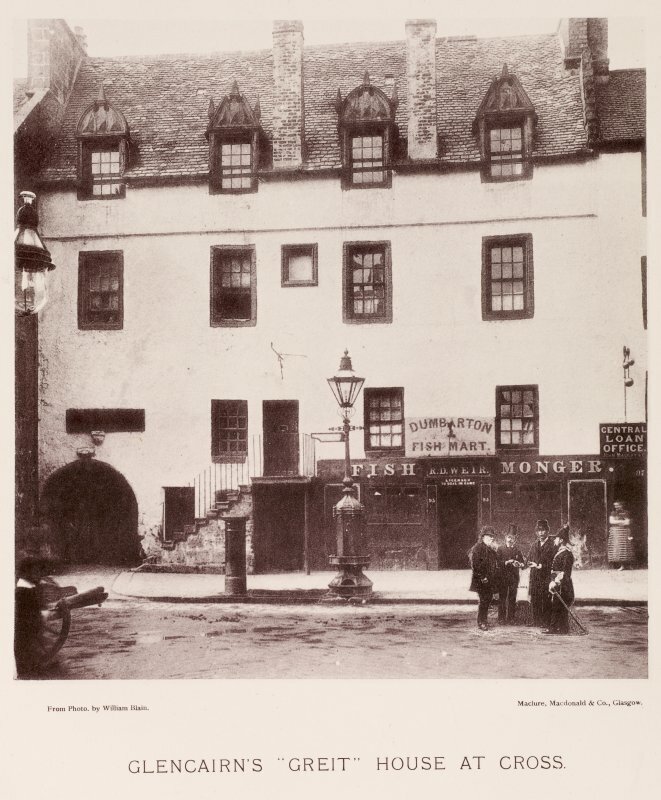 (NS 3950 7522) At the Cross in High Street, and looking up College Street, stands the oldest building in the burgh - the 'Earl of Glencairn's Greit House', built in 1623. This building has dormer windows, which are very fine specimens of early architecture. In 1923 it was acquired by the Town Council and scheduled as an ancient monument. Its architectural features have been preserved. Greit House is a typical 17th century town building. Large windows have been inserted in the ground floor which is now a gas showroom. Visited by OS (DS) 3 October 1956. Dated 1623 on its western dormerhead, it may, in fact, incorporate earlier fabric at basement level. It almost certainly stands on the site of earlier town dwellings. Built as a three-storeyed town house for the Earls of Glencairn (and later occupied by the Dukes of Argyll), it now houses the West Dunbartonshire Social Work Department. 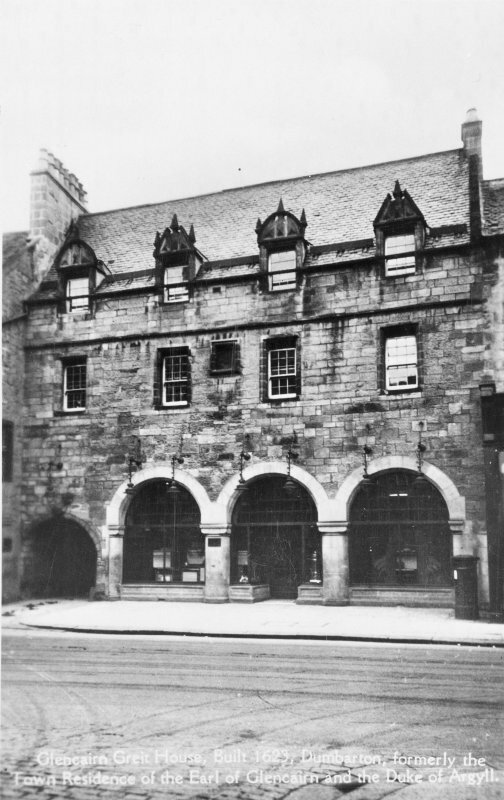 The residential apartments were previously reached by stone steps to first floor level; and a round-arched pend, at the east end of the building, led to the backlands of the tenement. 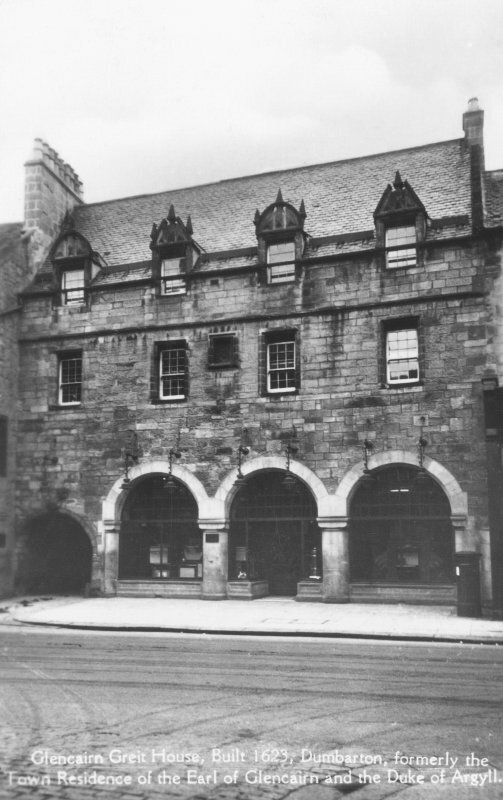 The front of the building was altered in 1924--5, but manges to retain, in the upper storeys, many of the architectural features associated with seventeenth-century Scottish architecture. Crow-stepped gables (now only at the westend), extensive decorative stonework, a central plaque recess, pedimented dormerheads and spike finials still stand testament to the status of the owners and skill of the builders. Buildings which have more than one phase of construction, such as Glencairn's Greit House, may also preserve earlier structural features within the fabric itself, hidden or obscured by later additions. On the ground floor, for example, these may be represented by floor surfaces, fireplaces and other features associated with the very earliest phases ofoccupation (in this case, at least, the seventeenth century) sealed beneath the modern floor levels. Throughout the house, more structural elements, such as blocked-up doorways, windows and cupboards, may also survive behind modern plasterboard. 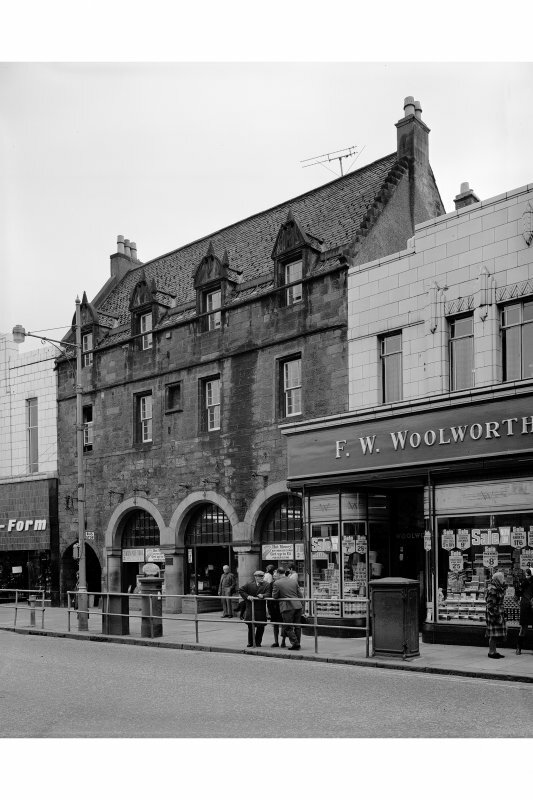 The earliest building on this prime street frontage would probably have been of timber, wattle and daub, perhaps with a thatched roof At the front of properties like these, there would have been small, temporary stalls, or booths, erected on market days, selling locally made produce as well as providing services such as repairs to shoes, clothes and tools. Evidence for timber buildings, some as early in date as the twelfth century, and with stalls attached, has been found during excavations in Perth, Aberdeen and Inverness. Information from ‘Historic Dumbarton: The Archaeological Implications of Development’ (1999).